The Mellon banks were a group of financial institutions instrumental in the industrial development of the greater Pittsburgh area in Pennsylvania, as well as, to a lesser degree, of other regions of the United States. Mellon funding played important roles in the development of coal, fabricated (but not primary) steel, aluminum (in particular Pittsburgh Reduction, which became Alcoa), and oil (in particular Gulf). Other notable companies benefiting from Mellon funding and oversight were Carborundum, a maker of grinding materials, and Koppers, a maker of advanced coking ovens that captured rather than simply vented valuable by-product gases such as toluene and benzene. Mellon banks at various times also provided financial resources for real estate development, lumber, mining, traction, railroad-car construction, and electricity-generating enterprises, both in the Pittsburgh area and elsewhere. This material was originally published in Oxford Encyclopedia of American Business, Labor, and Economic History edited by Melvyn Dubofsky, and has been reproduced by permission of Oxford University Press. For permission to reuse this material, please visit http://www.oup.co.uk/academic/rights/permissions. Field, Alexander J. 2013. 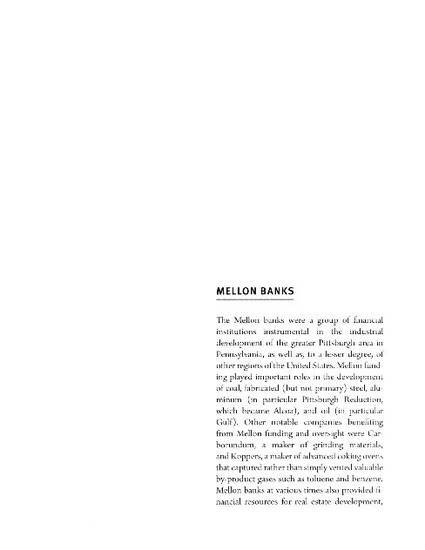 “Mellon Banks.” In Oxford Encyclopedia of American Business, Labor, and Economic History. Oxford: Oxford University Press.